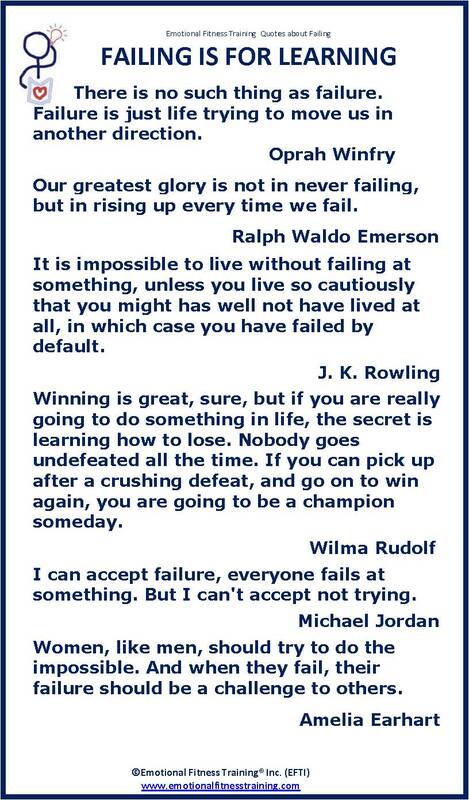 Failure is part of life. You will always fail. But as this poster reminds us, to fail does not mean you are a failure; the best use of a failure is to look for the lessons. The way you deal with mistakes teaches children a life lesson. Today’s parenting tip about failure: read this link: Brain Rules: 5 Brain Rules for Parents. In a few days I will be on a road trip back East for a visit. At least that is the plan and as my mother would say “God willing.” This means I might not be posting, although I am hoping to do some road trip posts on my Emotional Fitness Blogs and will at least try to copy them here. Much depends on the tiredness factor and the availability of wi-fi. Time will tell. Meanwhile, for all you do to spread kindness, thank you; it matters, you matter. This entry was posted in Parenting Issues and tagged Emotional fitness, Emotional fitness exercise, Emotional Fitness Training Inc, Emotional Health, emotional intelligence, Failure, Fitness, Life, mental-health, Parenting advice, postaday. Bookmark the permalink. They always seem to like it. Being unemployed makes people feel like failures and it is important that they realize it is a temporary set back, not a failure. I may borrow some of yours as well. Thanks! Yes, and the difficulty in the USA is expectations are so high and one is expected to pull themselves up by boot straps. Hard if you don’t have boots. Moreover, the jobs that many people did are vanishing. We were at a new Walmart’s Neighborhood Market tonight. Only two cashiers. All the rest self check out. My managed care is installing automatic check ins and I expect in time the friendly receptionists will be whittle down. Can no longer find a gas station with an attendant as you could in my small home town, once upon a time. A hard life out there for many. For all you do, thank you and remember to practice kindness, Play the Rice Game and help feed the hungry.